The new Radley signature bag for Autumn/Winter 2008 is now on general sale. 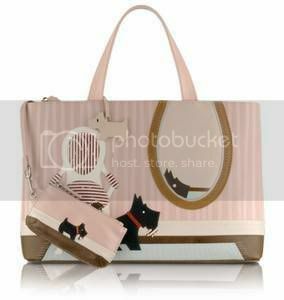 Known as the Radley Tearaway, the bag features the lovable Radley scottie dog in a mischievous scene where the dog has bitten a chunk of fabric from a chair. Part of the dog can also been seen in a reflection in the mirror. The Radley Tearaway bag also comes with a matching coin purse depicting the mischievous scottie dog. The Tearaway bag departs from the darker, Autumnal tones of previous Radley Autumn/Winter designs as this year pastel pink is the predominant feature. As with every Radley picture bag this is set to be a best seller !